Taking a step back, let’s walk through how we arrived at these findings. We previously described our efforts integrating user outreach into mozilla.com. For this post, we’re going to focus just on comments left by users during their visit to the Firefox “First Run” page, which brand new users hit upon downloading/installing Firefox for the first time (analysis of the Whatsnew and Getting Started pages will soon follow). About 1,200 people left feedback over the past month, and below is a breakdown of the feedback. 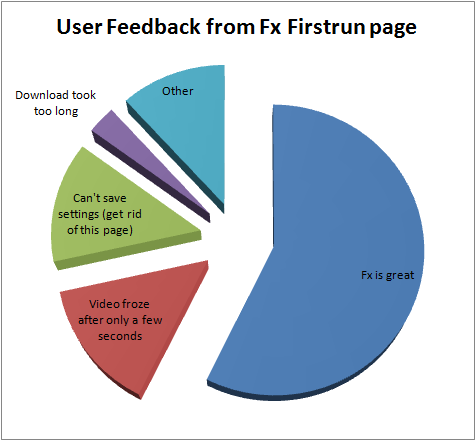 If you’re curious how this worked from the user’s perspective, click here to the firstrun page and then click on the orange feedback button. So, overall, the feedback looks really amazing. For such a high percentage of people to go out of their way to say something positive is incredible. Many people complained about the open video freezing. I’m not sure exactly what the issue is, but we can note that the next version of this page (for Fx3.6) will not include the same video. Perhaps more critically, many users talked about their frustration around Firefox not saving their settings. The most common comment was along the lines of, “why does this page open every time I open Firefox? Please get rid of it. I previously set my home page and Firefox won’t save the setting.” In addition, some people noted other preferences/settings not saving – add-ons, personas, favorites and bookmarks. How do we know that this latter group of users is frustrated? In addition to reading their actual comments, we can also look at the average satisfaction score (scale of 1 to 5) left by users in each feedback group. The findings are below… it’s pretty clear that this group, with a satisfaction score of 1.9, has been feeling extremely frustrated. Thanks to this insight, we’ve been able to prioritize a fix via bug 495735, and we’re hoping to ship it in the next release of Firefox! Thanks to Dietrich Ayala, Mats Palmgren, the Firefox team, and several others for making this happen. Could the freezing actually just be the video buffering? Could be a possibility. I suppose that at this point in time there’s no need for me or others like me to provide general feedback since there’s a snowball’s chance in hell that I’d ever stop using Firefox. Awesome work on this (as usual). I’ve always believed that providing service and support and really listening to and responding to a consumer can be more important than getting a person to try a product because first of all, that’s the easy part, and thirdly, and as you know very well, a consumer will quickly dump a product that they can’t figure out how to use or that has issues that they can’t find the answers to. I’ve personally never had those problems with any Mozilla product. The Mozilla communities are the bestest, most awesomest on the planet. Nowadays, I don’t make any big purchases or install software without checking out support and maintenance services first. Now I’m off to go find a spelling and grammar community. Wouldn’t the video load quicker if it was served from mozilla.com rather than dailymotion.com and autobuffer was/were(?) to be added to the video tag? Also, I rarely come across Theora videos that play smoothly and without interruption especially if they haven’t fully loaded yet and they appear to have frozen. Perhaps people are just too used to how quickly Flash videos load and run to be patient with a Theora one? Great survey! Very interesting to see this info. While I have only heard about problems with that video once before (one user consistently not being able to play on a fairly powerful computer with no other pages not loading), the problem about preferences not saving is a well known problem, which has been known to affect lots of people for many years. Sumo has some great documentation for that. Hi, I always love these metric break downs, they’re often a very insightful way of looking at things. I too have issues with the video, when I’m showing it off to people I always need to press play and then pause it immediately to let it load. Because otherwise it starts straight away and then after 2 seconds has to pause to buffer for another 5-15 seconds. The issue with the “can’t save settings” is usually a broken prefs.js file. Settings are not saved in this file and Firefox will open everytime with the startpagfe. All other settings that are stored in the pref.js will also not save. Firefox should detect this but maybe this and create a new prefs.js but this seems to be broken/disabled ? On several computers on at least two OSes (including an embarrassing moment when I was trying to demo to a new user how cool Firefox was) the video starts to play, then stops to buffer, and then never restarts again no matter how much you click Play or anything else. (I did file a bug on this.) It’s very annoying. I’ve also seem the problem reported by Asbjørn, where the video thinks it’s at the end after only a couple of seconds. I am really frustrated with the video freeze up. I googled a few fixes, but the problem now is the video is being buffered. What can i do to solve this problem, as I love mozilla, but not the annoying video freeze. I would say this seems about right, I love firefox for all its plug ins. Really sets it apart from the others. Currently I wouldn’t really think about using anything else. It does the job, and does it extremely well. I use Firefox all the time, the plugins available are amazing all my seo tools are running on firefox. i haven’t used IE for years. Firefox is a must for anyone in the IT industry. Internet Explorer does not fulfill the requirements. Nice. I enjoyed the blog post. I actually knew about most of this, but having said that, I still thought it was useful. Nice job!